In the mid-1500s when Spanish conquistadors “discovered” Chile they also discovered tens of thousands other people who already lived there. The Mapuche and other Native South Americans fought them for the next two hundred years, but eventually Spanish language and culture dominated the land. By the late 18th century, nearly 3/4 of Chile’s population of was of at least some European descent. By the late 19th century the Chileans themselves had started acquiring other lands, islands such as Juan Fernández (“Robinson Crusoe Island”), Sala y Gómez and Desventuradas, as well as 480,000 square miles of Antarctica. 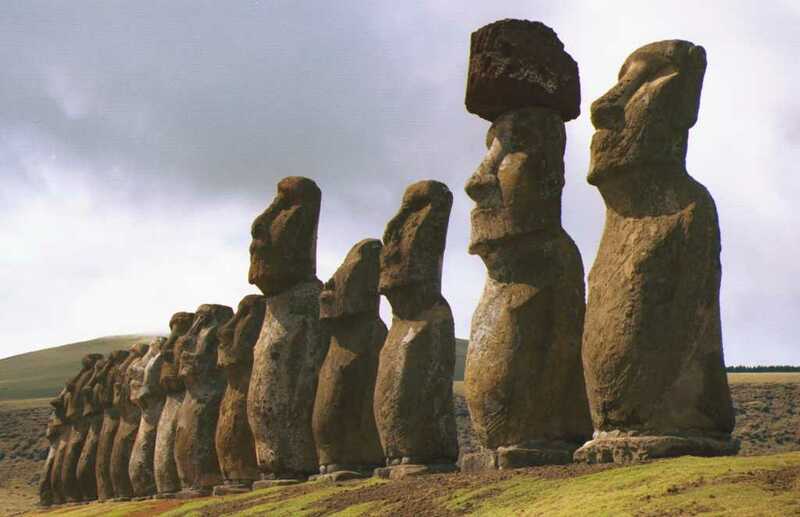 Chile’s domain also extends as far as two thousand miles into the Pacific, all the way to the world’s most isolated inhabited place — Easter Island. Originally referred to by the indigenous population as “Te Pito o Te Henua,” meaning ‘the center [or navel] of the world,” or Mata-Ki-Te-Rani, meaning ‘Eyes Looking at Heaven,” and today, in Polynesian as “Rapa Nui,” Easter Island is most famous for its mysterious 887 monumental statues — the moai. In the early 1970s Salvador Allende and his “Popular Unity” party won national elections and ushered in a short era of socialist reforms. In 1973, Augusto Pinochet led a military coup to overthrow Allende, beginning a very difficult fifteen years of his rule. Today, after voting Pinochet out of power and holding several subsequent democratic elections, Chile is one of the most economically and politically stable nations in South America. Even so, as regular earthquakes like massive 8.8 magnitude quake that hit Chile in February 2010 demonstrated, it literally sits on shaky ground. For more information: Wikipedia on Chile (grown-ups, note that before exploring the section about Allende and Pinochet you may want to think about how [or whether] you’ll discuss it with your kids) | “Easter Island Home Page” | Easter Island: What’s the deal with those statues?